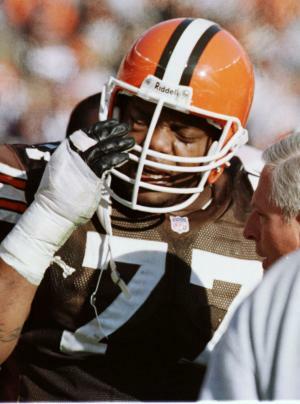 Former Browns OT Orlando “Zeus” Browns has been found dead today in his Baltimore condo. As of now, details surrounding the former NFL player’s death have yet to be released. Zeus played his college ball at South Carolina State University for Willie Jeffries. Brown only played for two professional teams in his NFL Career, the Cleveland Browns from 1993-1995 and again from 1999-2000. He also played for the Baltimore Ravens from 1996-1998, and finished his career with the Ravens, playing again for the team from 2003-2005. Most Browns fans will remember Zeus from the December 19, 1999 game against the Jacksonville Jaguars at home. During the game, referee Jeff Triplette threw a flag that accidently hit Brown in the eye. Ultimately, Zeus was ejected from the game and suspended by the NFL for knocking Triplette down on his way to the locker room. The suspension was later lifted when Brown’s eye did not heal. Brown was cut from the Cleveland Browns the following season. The injury caused Brown to miss three seasons in the NFL, but settled with the league for $25 Mil. In 2003, while playing for the Ravens, Brown started a game at both offensive and defensive tackle against the Oakland Raiders. The Ravens cut Brown in March of 2006. He then retired from the NFL. Brown was living in Maryland, and was the owner of the first-ever “Fatburger” Franchise in the state. Orlando “Zeus” Brown (December 12, 1970 – September 23, 2011) was 40 years old.